Reluctantly, Seth calls the only social worker he trusts with the traumatized boy—his wife. Carly is recovering from her own trauma suffered on the job, but she can’t turn away from this case, not from another child in trouble. With torrential rain bearing down, threatening to isolate their little town in a killer flood, Seth and Carly know the best way to keep the boy safe from danger is to take him back to their farm. But danger is as relentless as the storm. And it’s following them all the way home. To be honest, after reading the blurb, I was of two minds about reading this story. While I like Leigh's novellas, and most of the blurb sounded interesting, I was hesitant about reading about a child chained in a basement. I gave it a shot though and Leigh handled it well. She doesn't get graphic though she doesn't gloss over his conditions and she wasn't exploitative. "Twisted Truth", though only a little over a hundred pages, was fast-paced, exciting, intense, and heartbreaking. Although Liam is a few years older than the children I teach, it was hard not to see them in him and feel for what he was going through. We didn't get to know him well but what we saw was a sweet, strong boy dealing with far too much for a child his age. The story alternates between Seth's POV and Carly's POV. Although there are earlier novellas featuring them, this story works as a stand alone though you can best appreciate their marital challenges if you've read them. And though the book is marketed as a romance, it's predominantly a mystery with some romance. That worked for me, especially as I'd read the earlier novellas but if you're in the mood for romance, this may not be the book for you. It does have a happy ending however though parts of the mystery are still unsolved. Carly and Seth are working hard at communicating and trusting. Carly is still dealing with the aftermath of a disaster at her job and I likes that Carly was able to recognize that she needed help and was willing to get it, after some denial at first. Leigh continues her habit of including rules of small town living, such as there's always room for pie, and there's humor too. Prince Erik, the pet goat of Carly and Seth's daughter Brianna was a hoot, and a hero to boot. I enjoyed catching up with some of Carl's family, especially Bruce. I was worried about him after the death of his girlfriend in a previous story. 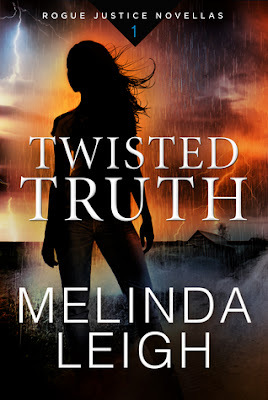 All in all, "Twisted Truth" was an engrossing story that I didn't want to see end and I've already requested book two, "Truth Be Told" by Leigh's writing partner, Kendra Elliot. ETA: Whoot! Book two is now on my Kindle! Review coming soon. I don't need the romance, and prefer the mystery to be the strongest thread. I usually prefer a more even mix in my romantic suspense but this worked for me and sounds like it would work for you.